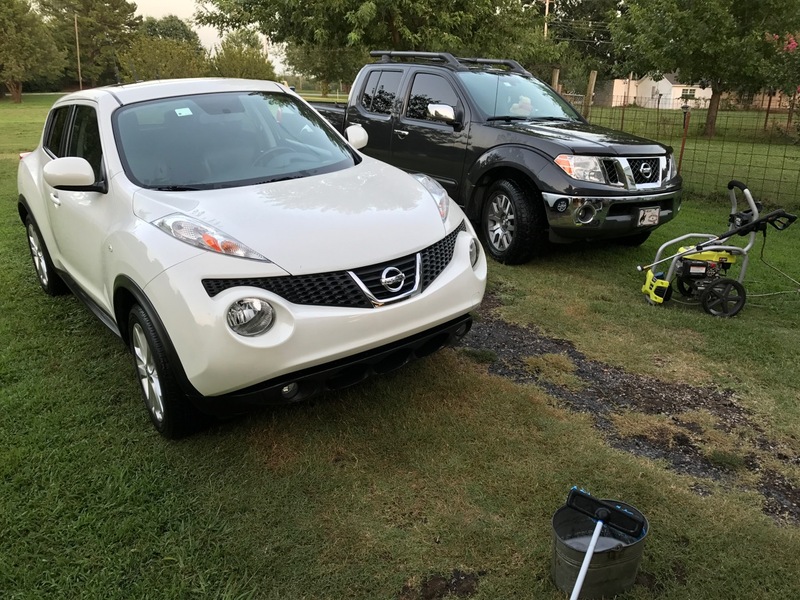 My Nissan Juke and Abby’s Nissan Frontier sit in the driveway after I washed and dried them. They look like new. I spotted this at a Sunday school classroom recently. 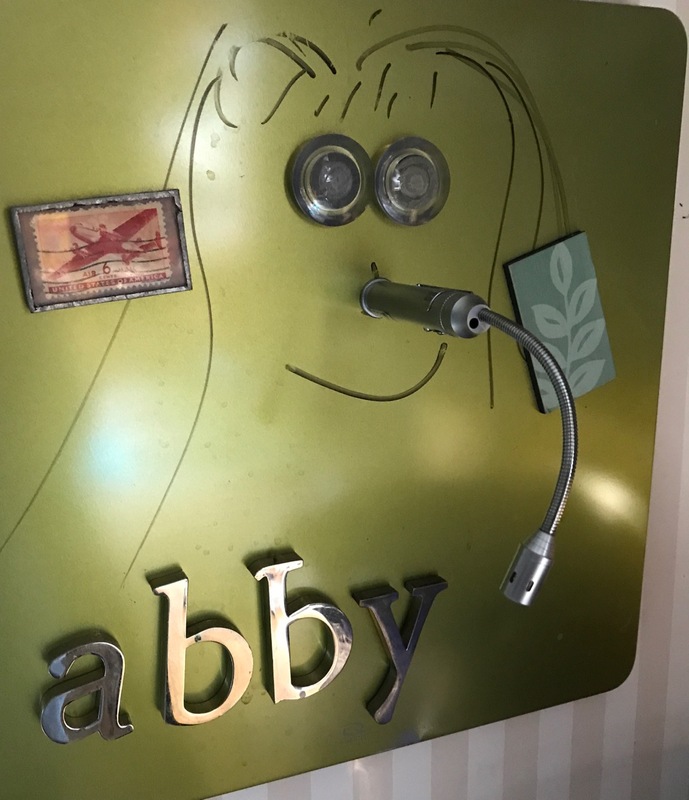 I know the spelling isn’t right, but I thought Abby would get a kick out of it. A buddy asked me the other day if I had posted anything on my site. He hadn’t seen anything. The answer was that yes, I had, but just a couple of items. I expect that he hadn’t seen them because, like a lot of us, we use social media as site readers, expecting to see links to our favorite stuff in our feeds. Recently, though, several people had indicated they aren’t seeing my stuff consistently, which doesn’t surprise me. I see less content in general in the summer. The optimist in me hopes this is because people are outside. Michael and Thea recently moved from Norman, Okla., to Oklahoma City, to a larger house, and to a location closer to their works. I’m happy for them, but I don’t admire the “interstate culture” that involves constantly using interstate highways every time you need a loaf of bread. My role in their move was to use Abby’s Nissan Frontier pickup to move a new dining set and a new huge-screen television from the store to their new home. The Visio television was interesting: it is a 65-inch flat screen with the option of using a phone app as the remote control. 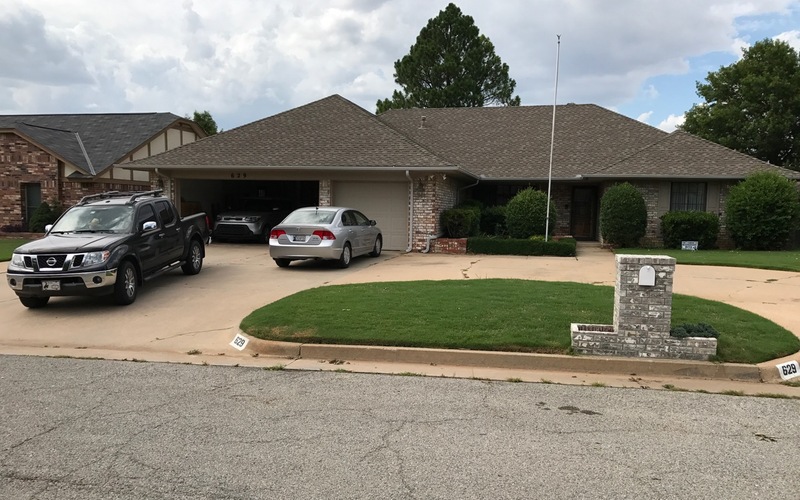 This is Michael and Thea’s new house in south Oklahoma City. In addition to being a bigger, nicer house, it cuts their daily commute to work in half. This is the 2017 Nissan Juke Ada Nissan lent me. It’s a nice car, but the dark blue reaffirmed my love of white cars, as it was untouchably hot sitting in the afternoon sun. 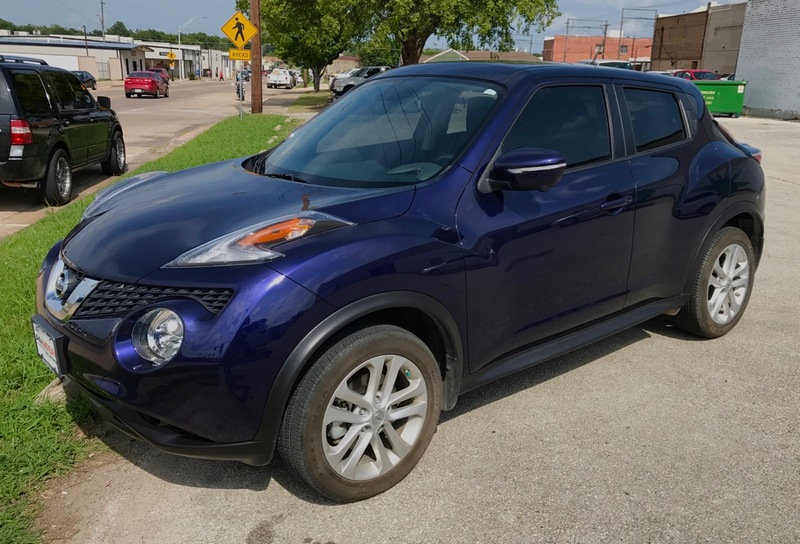 I had a big 48,000-mile service on my Nissan Juke, including oil, transmission fluid, air filters for the engine and the cabin, tire rotation and more. Props to Ada Nissan for getting the work done quickly, and for lending me another Juke, no charge. My wife Abby and I finished the quilt squares her aunt Judy asked us all to make for the next family reunion. The whole family was asked to decorate these squares, which Judy plans to make into a giant quilt and raffle off at the reunion in October. Abby and I took our squares – with pictures of family stuff – to Duncan last weekend, where we had lunch and fed the deer. 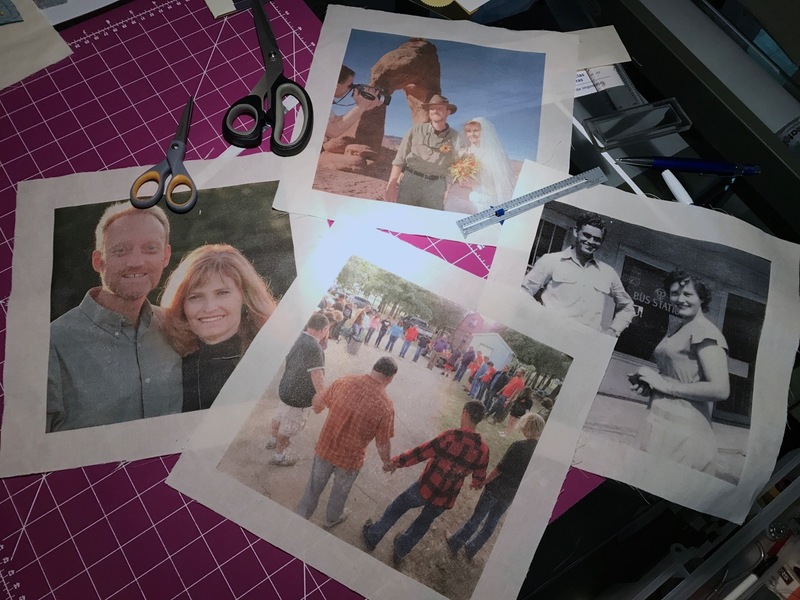 Abby and I used a fairly inexpensive transfer product to put photos on these quilt squares for the reunion quilt. 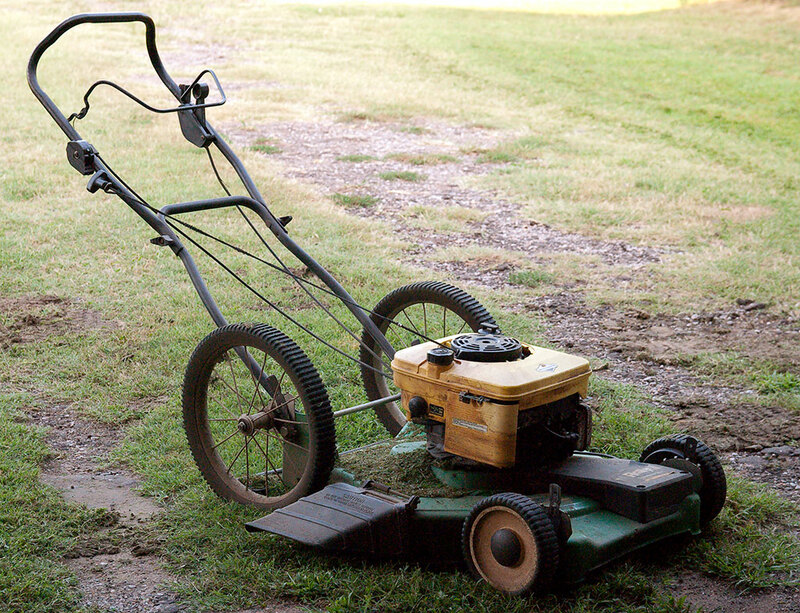 I’ve cut a lot of grass with this mower, since the first summer Abby and I were dating. It seems to give up once in a while, only to come back to life with some care. My push lawn mower has decided to be vexingly inconsistent. I was certain 10 days ago I was on the verge of buying a new one, but when I cranked it the last time, it started on the second pull. Ghost in the machine. I cranked up the power washer and washed my Juke and Abby’s Frontier, which always re-reminds me how much more we love our vehicles when they’re super-clean. I just finished teaching another intermediate/advance photography class. We had a great time. At one point, one of my students asked, “Is there and advanced advanced after this?” which I consider very flattering. One of my reporters and I covered a story about a firefighter who delivered a baby by the side of the road recently, and we both noted how cringingly stupid tv reporters’ questions are. “How does it feel to deliver a baby like this?” It’s like being punched in the groin, Sylvia. “Is there anything your want to say to the firefighters who delivered your baby?” Yeah, perv, get out of my coochie. 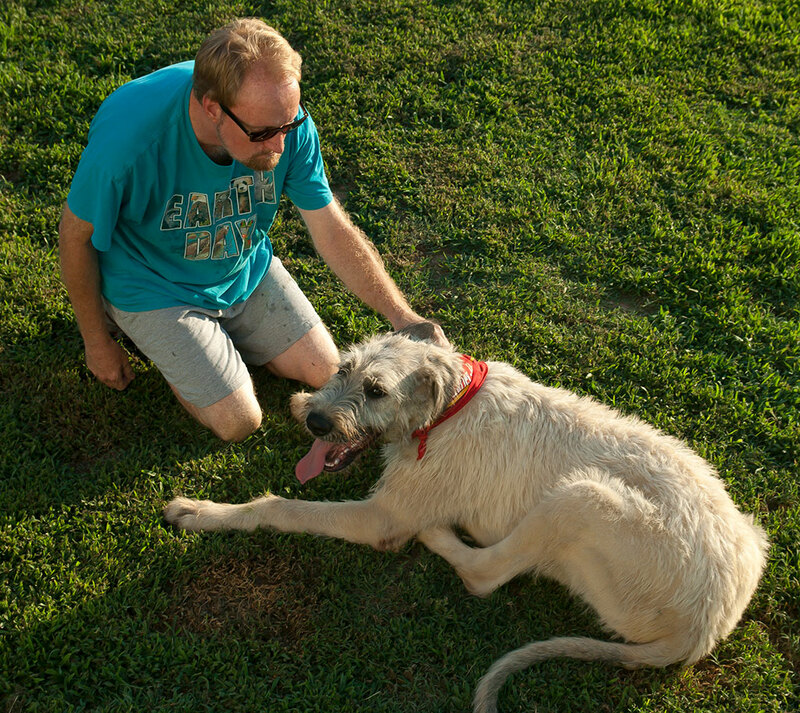 It’s hard to believe based on his appearance, but Hawken the Irish Wolfhound is still a puppy. Max the Chihuahua, who is now completely deaf, dug out of the front yard for the first time in a couple of years. I was very proud, though, when I caught up with him, that he followed me back to the house without a leash or picking him up. Hawken the Irish Wolfhound is off the charts lovable. Sierra the Chihuahua is fine, and eats her breakfast and dinner in about three seconds. She’s also been eating a lot of sh!t lately. Bad girl. I am the featured artist at this Monday’s Open Mic Nyte, which should be fun. All is well. Abby was briefly very ill, but we got her fixed up. Later this morning I hope to make her cottage cheese eggs. The magnetic dry erase board in the kitchen has been replaced by the Reminders app on our iPhones, so it’s just for-fun art now. If I were a bee named Abby, I would want my name to be spelled Abbee too. So cool about open mic night! I like Michael and Thea’s new house very much. Also light interior colors. My wife and I were frustrated during our recent car-shopping experience to find that a very low percentage of new cars have light colors inside. Black steering wheels, black dashboards, and black seats are all the rage. 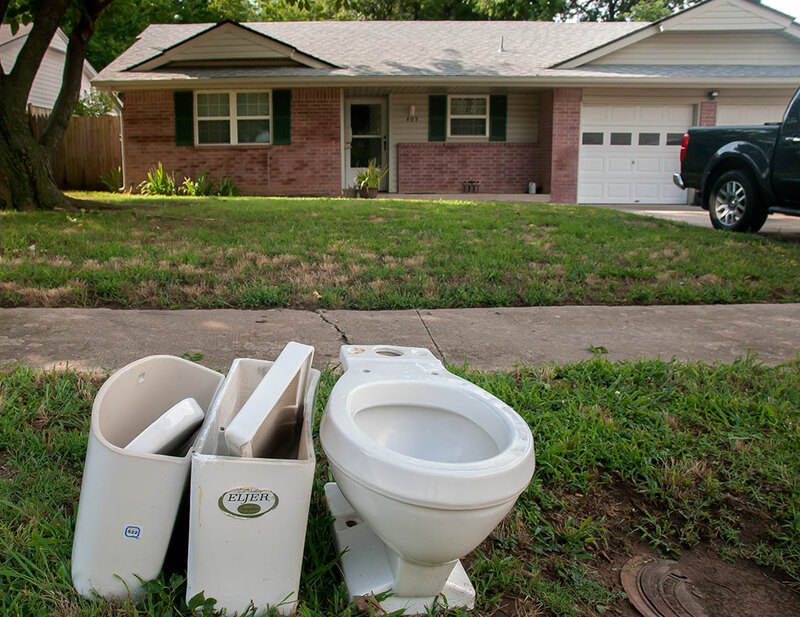 Multiple salespeople insisted we were the first customers to mention it. The Juke only comes with black cloth or black leather. Mine are leather, good quality and comfortable, but definitely heat magnets. Abby’s Frontier has grey everything.